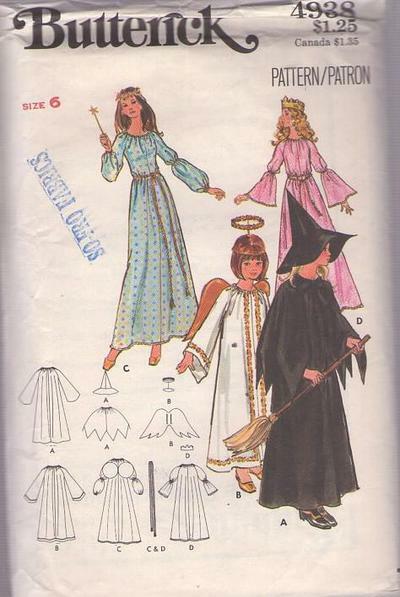 Bust 25", Waist 22", Hips 26"
70s Children, Retro Halloween Costumes Clothing Patterns - Witch, Angel, Fairy Godmother and Princess costumes. Loose fitting costume has raglan sleeves and elasticized oval neckline with sleeve and trim variations. With or without cape with pointed hem and self tie at neck. A witch has cape and hat. B angel has halo and wings, C fairy godmother has wings. D princess has paper crown. Purchased cord belts.